Experience brilliant quality sound now with F&D T-180X Bluetooth Soundbar and bring home the ultimate multimedia experience. Its Bluetooth 2.0 compatible speakers offer incredible audio clarity and excellent performance. Equipped with advanced acoustical engineering, these multimedia speakers are very good choice for music connoisseurs and will surely heighten your home entertainment experience. You can not only easily attach it to any compatible device but it will also ensure that it offers premium sound quality with its 7 cm full range drivers and 2 cm silk tweeter per channel. The speakers have a Bluetooth range of 10m with built-in efficient Class-D amplifier and also come with a wireless IR fully functional remote control. Its Bluetooth 2.0: 3.5mm stereo audio input cable and also supports Bluetooth connectivity. The table-top or wall mountable soundbar from comes with a compact design and will easily fit in any small corner of your table or desk. Its glossy look and sturdy bar design makes it a perfect product home usage as its carefully and elegantly designed exterior will make it compliment your home decor and improve its overall glamour. It will be a ideal partner for your LED and LCD screens at home. 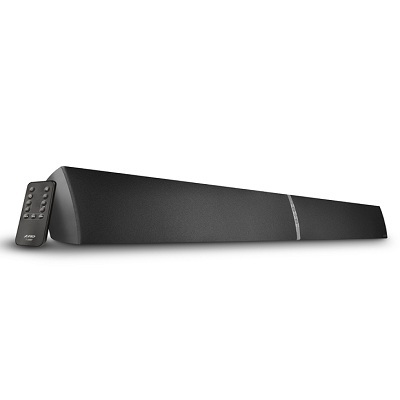 For connectivity, this F&D T-180X Bluetooth Soundbar has a 3.5mm stereo audio input cable and also supports Bluetooth connectivity. The speakers have a Bluetooth connectivity range of 10m that is adequate for most standard size rooms. When it comes to audio quality, this soundbar is designed for delivering incredible audio clarity and optimum performance that will surely satisfy all music lovers. It has 7 cm full range drivers and 2.54 cm silk tweeter per channel with built-in Class-D amplifier for the speakers. This not only produces superior quality sound but also make sure that the sound reach every single corner of the room to provide you musical experience like never before. This F&D T-180X Bluetooth Soundbar has a total power output range of 40 watts (20Wx2) RMS and a frequency response of 20Hz~20kHz. Some of its other important technical features are Standby, Power on LED light, volume up, volume down, source, 3D surround indicator etc.it also has a power input requirement of AC 220V~, 50/60Hz. Get hooked and addicted t..